Denver Botanic Gardens has partnered with Craig Hospital to offer an internship in horticultural therapy (HT) that meets the requirements of the American Horticultural Therapy Association (AHTA) for professional registered horticultural therapists. Craig Hospital is one of the top rehabilitation hospitals in the country specifically focusing on traumatic brain injury (TBI) and spinal cord injuries (SCI). Craig’s mission is to provide exceptional patient and family-centered care for those affected by spinal cord and brain injuries, striving for optimal health, independence and quality of life. To achieve this mission, Craig provides a wide range of rehabilitation programs. Of these programs, one that is integral to returning to life post-injury, is therapeutic recreation (T-Rec), of which horticultural therapy is a part. Rehabilitating from a TBI or SCI is not easy, and T-Rec offers respite from the demands of therapies, as well as offers patients adaptations so that they can continue to do the things they love when they return home. This process includes interviewing patients to learn about their interests. Communication with the patient’s treatment team, including doctors, physical therapy, occupational therapy and more, helps us to evaluate patients to create goals and activities that are in alignment with their treatment plan. Patients are referred to HT by recreational therapists who learn that gardening is a hobby or interest. Occupational, physical or speech therapy also arranges co-treatments with HT to work on functional skills. Patients can get involved in HT by signing up for group horticulture activities, which range from making kokedama moss ball planters to painting birdhouse gourds grown in the Therapy Garden at Craig. For individual sessions, we create activities that are driven both by the patient’s interests and by specific goals the patient is working on. We often do co-treatment sessions with a patient’s occupational therapist or speech therapist so the patient can be further supported in working on relevant goals. For example, for a patient who is working on strengthening their hands post-injury, we may practice skills using adaptive tools. For a patient who has experienced a brain injury and is experiencing left neglect, where they have trouble paying attention to their left side of the body and left field of vision, we may practice left attention and left visual scanning by deadheading a patch of flowers. Adaptive tools and wheelchair accessible gardens are integral for working with patients at Craig Hospital. We use a variety of tools that are adapted to the needs of patients, ranging from specifically manufactured tools, to creating many of our own using common items such as duct tape, funnels, rubber bands, and spoons. When you look at the world through the perspective of a patient at Craig, it is easy to find ways to "do"! One item that we use often is a utility cuff, or "U-Cuff," which is a cuff that fits over a patient’s hand. The cuff includes a pocket in which a tool can be inserted and allows patients with low hand strength to work with tools independently. While at Craig, I designed and led a group activity making herb-infused vinegars. Facilitators harvested and prepared fresh herbs from the Craig Therapy Garden. Patients were empowered to create their own herbal vinegar recipe. Myself, my mentor, Susie Hall, volunteers and family assisted with adaptations to allow the patient to make their herbal vinegar as independently as possible. It was a wonderful sensory experience, as the table was filled with the sights, smells and textures of fresh herbs. I am grateful for this partnership between Denver Botanic Gardens and Craig Hospital to offer this HT internship. I am thankful for the incredible staff in the T-Rec department at Craig Hospital, especially Susie Hall. 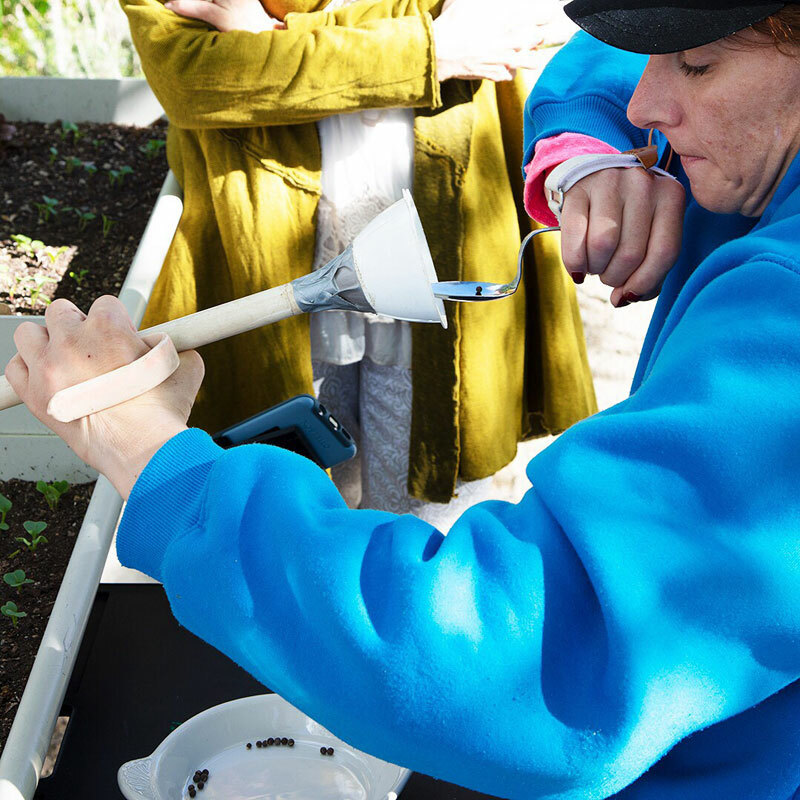 Working with patients at Craig has pushed me to develop my skills working with differently abled populations, and inspired me to continue accessible gardening in my future. 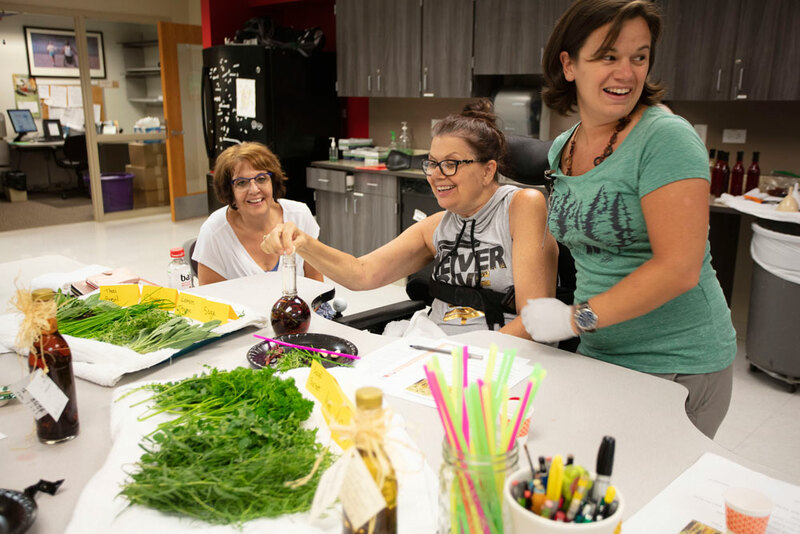 Patients and volunteers at Craig Hospital creating herb infused vinegars during a group horticultural therapy activity. 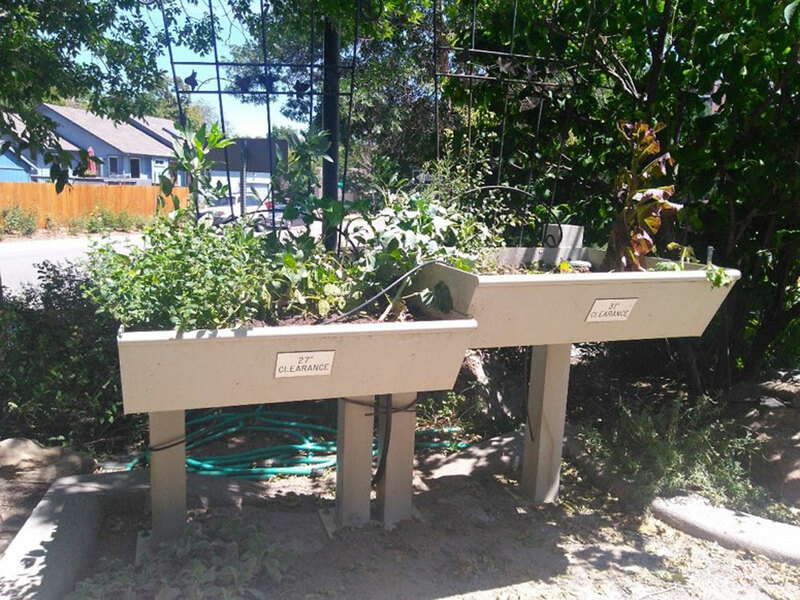 Examples of wheelchair-accessible raised planter beds. Adaptive tools can be fashioned from everyday materials such as spoons, funnels, duct tape and PVC pipe. Here, a patient is able to independently plant seeds using adaptive tools.